Behold this display of the skulls of my enemies! Dragon skulls, or the dried seed heads of snapdragon. This weekend we were collecting the seeds of some of our wild flowers so we can try to take some of them with us when we move, for their appearance and also for the bees we hope to keep once we settle in. We have a beautiful yellow snapdragon that came up of its own accord on the front drive and I don't much believe in removing beautiful things just because they came up in the wrong place! Another culprit on our drive is a dainty little perfect red poppy that comes up every year so we made sure we saved a good few handfuls of seeds to give them a try out there. 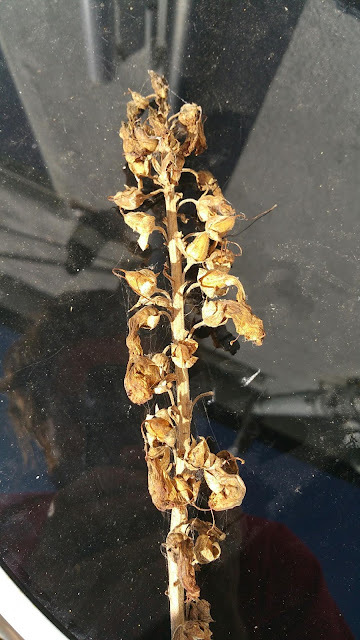 We also collected some seeds from the apricot foxglove, I'm planning on taking the plant with me but just in case it doesn't survive he journey at least we have the seeds as a back up. What wild flowers do you have around the place? Do you actively save flower seeds yourself? Also if you head over to 5 Acres and a Dream the lovely Legih is doing a Giveaway on her new book "How to bake without baking powder"
I have poppies that spring up everywhere and I love them all--purple is my favorite one. It took me YEARS to get wild foxglove established but now I have a great "stand" of that and adore that as well. At least now you can plant those seeds where YOU want them, not where Mother Nature decided they should be.....though , as you know, Mother ALWAYS knows best! haha! my great nan used to make my great grandad pull over when they were out driving in the country side so she could jump out and take cuttings/dig up roots of any plants she saw that she liked, i'm not sure how much she minded if they were in someones front garden! 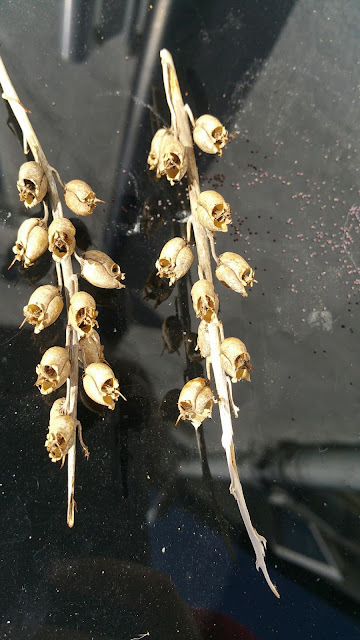 I have never seen that "skulls" thing. That's what it really looked like. We have few flowers around our place because the chickens scratch them up. But there are lots in the forest. There's a lily looking plant with reddish orange flowers, the people here call it a flame flower but I don't know what it's real name is. Also some giant blue flowers that grow on a vine. They have yellow centers. I wish I knew more about plants. I've been living up in these mountains for more than thirty years now, and I still don't know jack about the local plants. I do save seeds, my love in the mist have been spread all around our garden. I also scatter loads of seeds each year straight onto the soil to see what will grow. i save seeds from all of our vegetables, fruit and flowers that we grow for re-planting the next year. 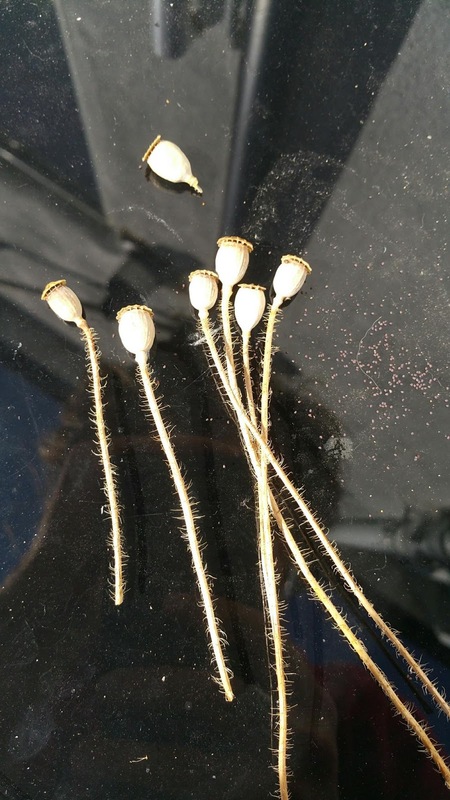 but i also save wild lupin seeds (such beautiful flowers! ), sunchokes, wild st. john's wort, wild evening of primrose and wild comfrey to trade and send to friends. are you interested in any of these? i will gladly send you some. oh and i thought i had you listed in our blogroll and then realized that i didn't. your listed now. send me the address that you will be at in octoberish to kymberzmail@gmail.com and i will get those seeds to you (have to wait for them to go to seed first). it is exciting to share seeds and the 3 types you want are beautiful medicinal herbs...i would love to see cape breton seeds flourishing somewhere in europe! Tricky, I found you from Kymber's blog and I was trying to become a follower but the link when I click it says it's broken. I'll keep trying. Now I'll go back and read about your adventures!